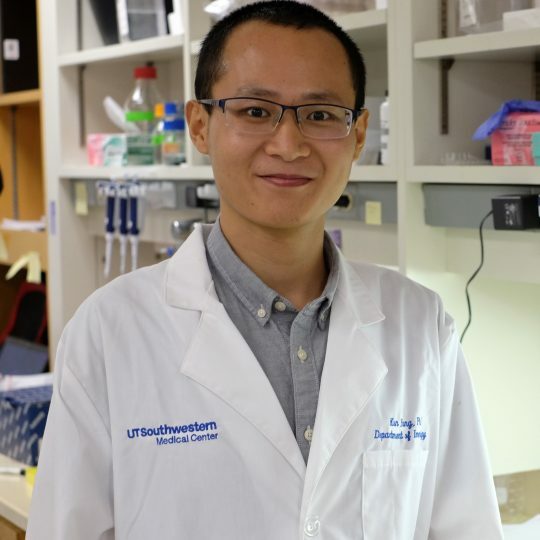 Kun Yang is currently a Postdoctoral Researcher in Dr. Nan Yan’s lab in the Department of Immunology, UT Southwestern Medical Center. He earned his M.D. degree in 2010 and Ph.D. degree in Immunology in 2015 both from Sun Yat-sen University in China. Dr. Yang is primarily interested in understanding the molecular mechanism of innate immunity and the pathogenesis of autoimmune diseases. His graduate study focused on investigating the role of innate immune sensing pathway in infectious diseases. After joining Dr. Yan’s lab at UT Southwestern Medical Center in 2016, Dr. Yang has been working on characterizing immune phenotypes of NGLY1 deficiency and exploring the underlying mechanism with the aim of developing new therapeutic strategies for the disease.